Some beautiful things have been created for very simple and practical purposes. Just think of all the wonderful treasures that now fill our homes as decoration that were once made to fill a need. 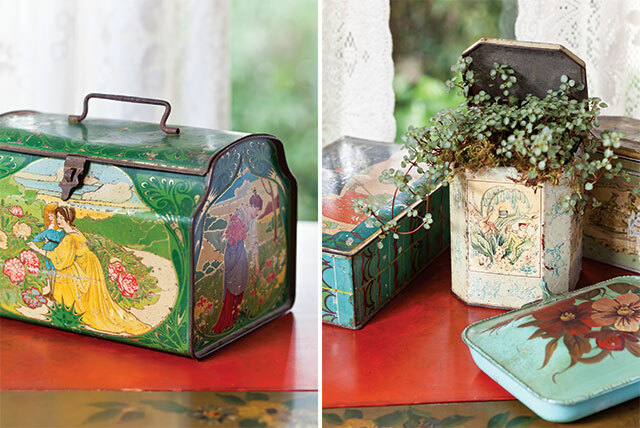 Necessity has often been called the mother of invention, and the biscuit tin is one of those items that was made out of necessity, used and appreciated, and can now be found in our homes as a quirky container, a charming collectible, or a pop of color. One of our magazines, The Cottage Journal, wrote about the history of the biscuit tin in their spring issue this year. I thought the history behind it was so interesting, and you know how my ears perk up when I hear a good entrepreneurial story. English biscuit maker Joseph Huntley had the advantage of owning a shop across from a regular stop on the stagecoach line, and passengers were often customers. The ride on the stagecoach in the 1800s was rough enough for people, let alone perishable little biscuits. Huntley realized the need for some kind of protective packaging for the biscuits, so he began placing them in metal tins. That simple idea led to the formation of two companies: Huntley & Palmer, a biscuit company, and Huntley, Bourne, and Stevens, a firm of biscuit tin manufacturers founded by Huntley’s son. Because of their great success, many imitators followed them into the biscuit tin business. In the late 1870s, the tins started to be embellished with colorful decorations and formed into unique shapes. Even after the biscuits were eaten, the tins were treasured and used to store small household items. This was recycling before recycling was even a thought! These little tins started as a simple airtight storage solution and have turned into charming—yet still practical—collectibles for our homes. 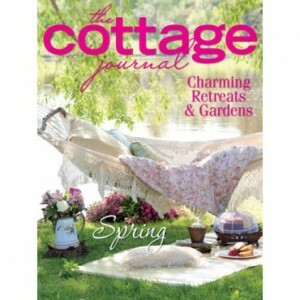 Pick up the spring issue of The Cottage Journal to see more fascinating stories and, as always, stunning homes and gardens. What are some other home collectibles you’d like to know more about? It is because of your many stories and because I love Victoria Magazine so much, that I fervently wish (this is the librarian in me) that all articles could be searched in a subject index somewhere. Please let me know if there is a good way to do this…especially as I plan my next trip. I have collected tins for years, but have so many that I have donated most all to Goodwill. We are remodeling & I am changing my decor. I did save a few vintage ones. It was hard to let go. I just bought a copy of this magazine and was excited to read your post. Looking forward to relaxing with a cup of tea and reading it this evening. Waterside picnic and The Shabby Chic garden caught my eye! Lovely treasures! I love depression ware, green, but have precious little of it. Inspired to renew my collecting habit! Would love to read more about the different types of depression glass and the importance of its colors. Crazy about all your magazines! I have a collection of tins. Some I keep my writing paper in (yes, I’m a dying breed) some I keep notes from my 2 girls they wrote me when they were little. Some I keep treasures in. Growing up in New England (Lexington, Mass.) we always had Uneeda Biscuits. My Dad loved them as well as us kids. 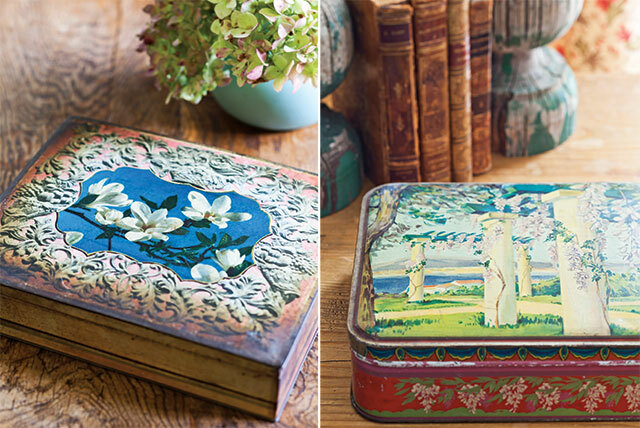 After I was married, I found an antique Uneeda Biscuit tin and gave it to him. He always put his Uneeda’s in there until they stopped making them. Then he stored his saltines in it. 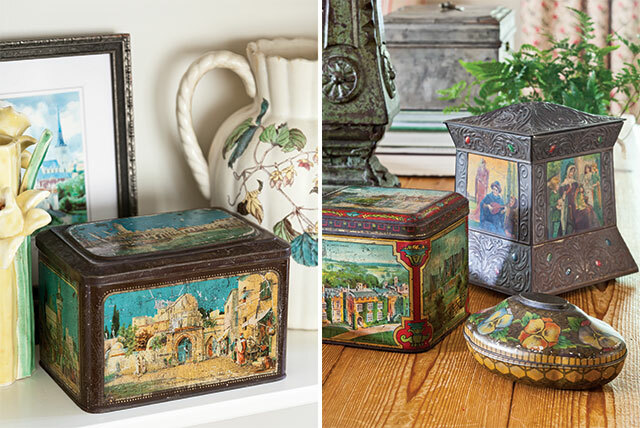 I collect small boxes of all sorts–wood, metal, etc.–and tin boxes fall in that category. Colorful tins are lovely to look at and use for embroidery, sewing or other craft items. Thank you for your blog. It is a joy to read your e-mails and drop by your blog. I have a few french brand cookie tins , I put them on display and use them all the time to store my cookies. These biscuit tines are lovely. My mother (1898 – 1994) was a member of the Guild of American Decorative Painting, and painted every tin she was able to acquire from anywhere —- also chairs and chests. She did some lovely things, but was so prolific, that all five of her children, all of her grandchildren and some great-grandchildren all have her things on display. And as we all downsize — we definitely have a problem……….. Thank you for sharing that with us Phyllis…the tins are very pretty and unique. I still use tins for my cookies but they’re not collectibles…they are seasonal though. I have always wondered where the idea for egg cups came from. I have a few old ones and have added some new ones to my collection. I use some for their intended purpose and the others for display,especially at Easter time. I still use tins for storage whenever possible. My family bought and saved quite a few over the years and they are still in great condition. They are not collectibles like the lovely ones above, but they are a very attractive and practical way to store cookies, crackers, rice, and even chocolate! I have a set of three tiny tins that have seashell images on them, and they remind me of my dear Aunt Liz who purchased them years ago. I have them proudly displayed in my curio cabinet. Oh, Noooooonooo… Something else to collect! Poor hubby. Just when he thought I was through collecting. The search is on. Thanks Ribbons! I love repurposing!! I will watch for these darling tins. My little granddaughters love boxes for their “treasures”. These would be another perfect one!! As always, I wait for your “RIBBONS”! Ps I love my “Cottage Journals!! When I see these tins today, I never think about what their real purpose was way back when. It was really cool to be able to read about the history of the biscuit tin. And the pictures were so pretty. Thank you for sharing this with us.